What is the proper role of money and markets in a democratic society? How can we protect the priceless goods in moral and civic life from being bought and sold? Does everything have a price? Sometimes you might think so. In the US, egg donation agencies will pay college women between US$5,000 and $50,000 for their eggs. The price rises with their SAT scores, the institution they attend, and their attractiveness. Ten years ago, if you were really hard up, you could make a quick buck by posing as a human billboard. Karolyne Smith sold the advertising space above her eyebrows to an online casino, GoldenPalace.com, so that she could finance her child's schooling. Now she has to wear bangs to hide the disfiguring tattoo. At the height of the AIDS epidemic, investors discovered the profitability of financial instruments called viaticals. They would buy a US$100,000 life insurance policy from a dying AIDS patient for $50,000. If the patient died in a year, they would make a 100 percent profit. Of course, if he lingered on, the rate of return declined steeply, so investors had to pray for an early death. Retrovirals killed this sector of the market because AIDS patients started to survive. Is there anything wrong with transactions like these? 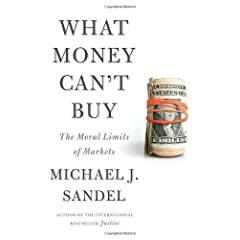 In his latest book, What Money Can’t Buy, about the moral limits of markets Harvard professor Michael J. Sandel argues that there is. Sandel is one of the best-known academics in the United States. His popular Harvard course on justice is offered online and he fills lecture halls, even stadiums, with fans around the world. He is troubled by the notion that everything in life can be construed as a market transaction. Markets are expanding into spheres of life where they do not belong and we are drifting from participation in a market economy to immersion in a market society. A market economy is a tool for organising productive activity. But a market society is based on an ideological distortion of the law of supply and demands. He offers scores of innovative ways that investors are monetising social life, not just material goods, in ways that seem unfair or degrading, both small and big. Some schools offer children $2 to read books to encourage literacy. An Indian surrogate mother can be engaged to bear a child for around US$10,000. You can earn $7,500 to serve as a human guinea pig in a drug trial. For $1,500 or more a year, you can get same-day appointment with a “concierge doctor” for your ailments. Sandel contends that there are two problems with the omnivorous behemoth of commercialisation. The first is that it justifies inequality. Why should more affluent people get the best medical care, live in the safest neighbourhoods, or have the most political influence? He discusses this problem by examining the morality of queues. For instance, New York City puts on free outdoor Shakespeare performances in Central Park in the summertime. Demand is intense and the queues are long. Some people pay line standers over $100 to stand in the queues so that they don’t have to wait. In Washington lobbyists use the same system for congressional committee hearings. Time for money: isn’t this fair? Not necessarily, says Sandel. The moral justification for markets is that they distribute goods efficiently to the people who want them most. But this isn’t always the case. Willingness to pay for a ticket may not indicate that the purchaser values the good more highly. In fact, a wealthy queue-jumper may not value Shakespeare nearly as much as people who wait for hours. One of the great defects of a “market society” is that the affluent and the poor live in isolated silos. This is not good for democracy, says Sandel. A democratic society can only flourish when all citizens take responsibility for the common good. But unless people of different backgrounds mix and negotiate their differences, how can this happen? Second, commercialisation can corrupt goods by treating them inappropriately. We all accept some limits: selling votes or trafficking babies is universally condemned. But the very fact that a price is set on a transaction changes people’s attitude towards it. Sometimes it demeans them. Ultimately his aim in What Money Can’t Buy is to get people to question the ethics of a system which resulted in the financial crisis of 2008. Much to his disappointment, contemporary politics remains “vacuous”, and there has been no serious discussion of the limits of markets. He calls for a robust, respectful debate about competing conceptions of the “good life”. What things will we fence off from commercialisation? Sandel’s ultimate message is that economics cannot escape the fact that the market sends moral messages as well as price signals. Society, not economists, must be the arbiter of whether those messages are acceptable. His ideas are particularly relevant to contemporary bioethics debates about IVF, surrogacy, organ transplants, the sale of eggs and sperm, and public healthcare. The fantasy that economics is a value-free science really means that it has become captive to utilitarianism. And in reducing everything to cost-benefit analysis and in refusing to accept that some things have an intrinsic value, utilitarianism is one of the great enemies of a truly human society. Sandel’s short and entertaining book is an excellent defence of enduring human values against the corrosive notion that everything has a price.